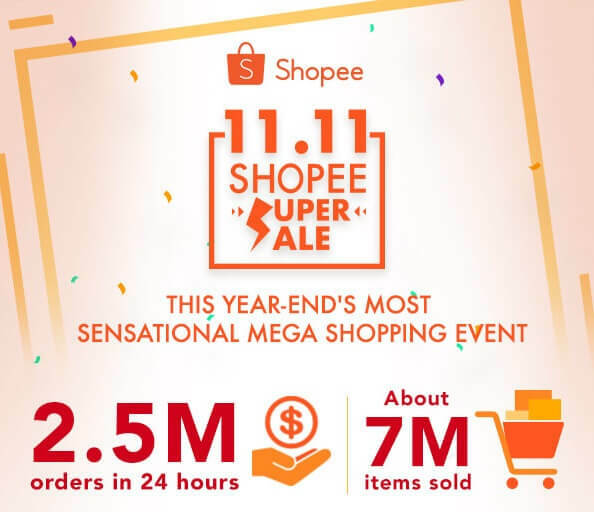 Shopee recently had a record-breaking 2.5 million orders in just 24 hours in line with its 11.11 Super Christmas Sale. With over 120,000 brands and sellers offering huge discounts and deals, consumers enjoyed shopping while products were tagged at a lower price than usual. Also, according to Shopee, one seller had more than 6,500 times increase in order volume during the promo. Total traffic surged by three times, too, within first 10 minutes of the sale. They also recorded the highest number of items sold within a minute, hitting an all-time high of over 12,000. “The start of Shopee Christmas Sale which is the 11.11 sale was created to provide our users great cost savings during the year-end festive season, and we are thrilled with the overwhelming response. We would like to thank everyone who played a part in making this event a huge success. We will have a fresh wave of massive discounts coming up until December 25, so stay tuned for more excitement coming your way,” Terrence Pang, Chief Operating Officer of Shopee, said. In addition, Shopee said that this year’s event has outperformed last year’s 11.11 recorded orders. For more information, visit http://shopee.com.sg. Meanwhile, you can download the Shopee app for free via the App Store and Google Play.